Why do I do this? It's simple, actually. I love what I do. It's fun. It's an opportunity to bond with my clients, even if they're not technically my clients yet. Let's face it, planning a wedding and finding all of the right vendors can be a lot of work. More often than not, it's the first and only time a couple will be doing it. If I can instantly show a couple I've never met before how great we will work together and produce great images under any circumstances, then not only will my couple go home having one of the most unique date nights they have ever had; they will also feel secure knowing I'll be ready to do all it takes to capture their wedding day's moments. Alyssa and Tamer agreed to meet me at Dullboy on Grove Street in downtown Jersey City. 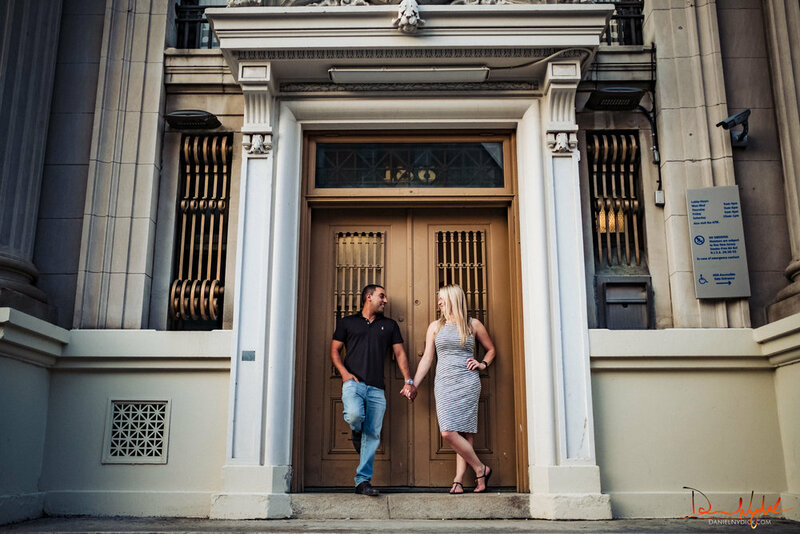 I wanted to hear about the wedding they are planning at The Rockleigh, and I wanted to spend some time with them showing them why I'm the right photographer for the job, We talked about having a drink and a light bite, but opted to just talk, walk, and play first. I could keep writing blah blah blah, but I'm sure you're ready to see the shots. Here they are. Click on any photo below to view it in its full-sized glory. Somewhere between the daytime photos and the nighttime ones, we did stop in Dullboy for more conversation and some snacks like pulled pork empanadas with xo sauce, sichuan peppercorn, and pineapple glaze; charred octopus with smoked potato chowder, collard greens, and hot honey; and the board with seasonal pickled and smoked vegetables, cheeses, pita, and hummus. Oh, and my drink? The Cora with avua ambarana cachaca, del maguey vida mezcal, carciofo artichoke liqueur, charred pineapple, agave, pink peppercorn, and lime. I had a wonderful time, and Alyssa and Tamer had so much fun kissing, laughing, dipping, and playing. The night was a success for all. I'll leave a photo of my cocktail that night as a CHEERS to Alyssa and Tamer.